Community Q&A Question: What top end kit? 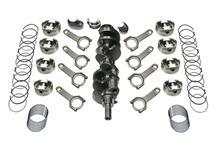 Will the SVE top end kit bolt up to this stroker kit without any fitment issues? Block is .30 over and want to make sure everything will bolt up. Thank you! If there is a fitment issue do you have a kit that fits? on any engine that you put together with aftermarket parts you will have to check piston to valve clearance to make sure there are proper tolerances available. The reason we say this is that all blocks "even stock motors" have varying clearances due to the machining process that is used and what tolerances they have set. While you should have no problems with the combination you are asking about, it will still require checking the PTV clearance to make 100% sure.